After I recorded a “Groovy”-related appearance on “The Electric Ballroom” — Keith Roth’s Sunday night rock ‘n’ chat show on WRAT-FM — he slipped me a copy of the “Let Me Down Hard” soundtrack CD from last year. I was heading up to Edison for my newspaperin’ job. “Cool, I have a soundtrack for the ride,” I said. Little did I know that the disc would stay in my car’s CD player for the next two weeks. I’ve listened to it over and over. Some tracks I skip over, but some have entered my bloodstream. What I dig about the record is that it’s so New Jersey. But not in the Bruce/Bon Jovi/pork roll sense that the rest of the U.S.A. thinks of Jersey rock. Anyways, I had the urge to put down my thoughts about some of the tracks on the record. These are followed by excerpts. Speaking of Bruce-ish … John Eddie’s song, which closes the “Let Me Down Hard” soundtrack album, is like a lullaby after all the power chords. His song, of course, gave the movie its title. (Roth also sang it, strumming an acoustic, at the Brighton Bar in one scene. Roth’s version is Track 21 on the soundtrack.) Eddie’s live version is restrained — you could almost call it gentle — in contrast to the pained, you-broke-my-heart lyrics. 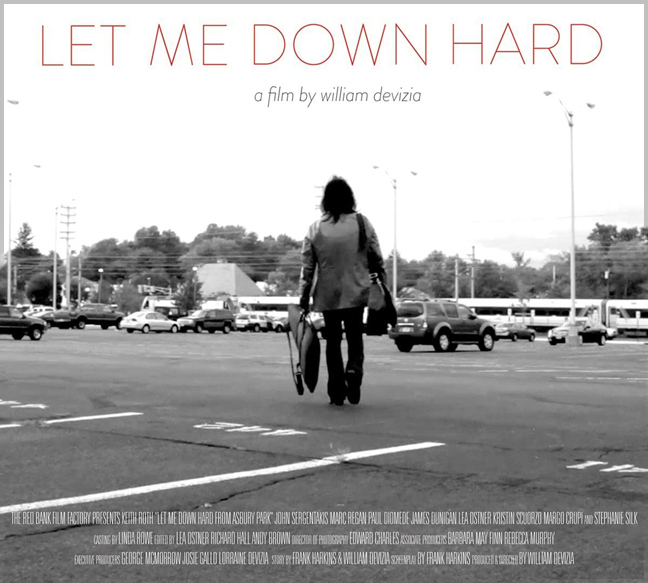 More about the “Let Me Down Hard” soundtrack HERE.